Home » Coast to coast » Defend Planned Parenthood from right-wing attacks! 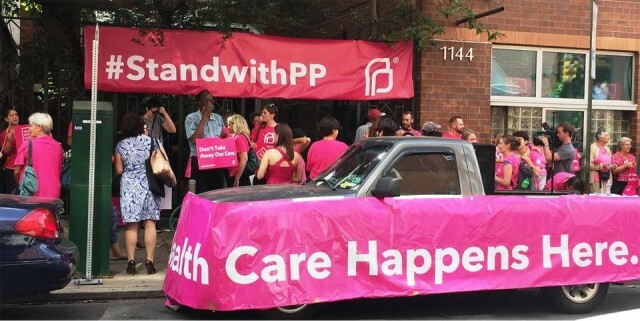 Defend Planned Parenthood from right-wing attacks! Planned Parenthood — one of the country’s major health care providers – is under attack by reactionaries inside and outside the government. The organization annually provides essential reproductive and other health care — contraceptives, abortions, counseling, screening tests and treatments — to 2.7 million, mostly low-income women and men. Conservative pundits and Republican presidential candidates are outdoing each other in smearing Planned Parenthood in their goal to destroy this vital organization. Behind their bellicosity about its abortion services is also a concerted attack, with racist overtones, on the right of low-income women, including African Americans and Latinas, to government-funded health care, which right-wingers want to limit, even stop. One-half of Planned Parenthood’s clients use Medicaid. Anti-choice forces have circulated a deceptive, heavily edited video about Planned Parenthood and whipped up their right-wing adherents by claiming that the group reaps big profits from selling fetal tissue and that it is guilty of “infanticide” — an outrageous and false claim. Selling fetal tissue for important medical research, which involves 1 percent of its clinics, is legal. These harangues continue despite Planned Parenthood’s repeated assertions that government funds are not used for abortions. In fact, the reactionary Hyde Amendment prohibited it beginning in 1976. A congressional committee vilified Planned Parenthood CEO Cecile Richards at a sham hearing on Sept. 29. Citing the fraudulent video, its members interrogated her for five hours, cutting off her replies and personally attacking her. Those leading the misogynist witch hunt were caught in their own lies with phony “evidence” of the organization’s alleged wrongdoings. The inflammatory videos and heightening of the right-wing’s toxic rhetoric against Planned Parenthood have resulted in an uptick in physical violence against its facilities. These include arson fires set at clinics in Thousand Oaks, Calif., and Pullman, Wash., in September; and in Louisiana in August, there was an attempted arson at a New Orleans health center, which ignited a vehicle, and a sign removal from a Metaire facility. Since the 1970s, more than 200 arsons and bombings of clinics have occurred. In this climate of rising hostility to and restrictions on women’s reproductive rights and medical care, signals are being emitted that it’s OK for anti-abortion extremists to carry out violent attacks on clinics. Public backing for Planned Parenthood is urgently needed. 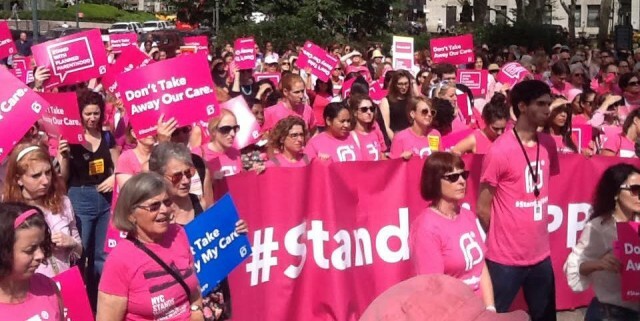 Women showed their support on Sept. 29 when activists and clients delivered petitions headed “I Stand with Planned Parenthood” signed by 2.4 million people to congressional leaders. On the same day, 300 rallies and other events were held around the country on National Pink Out Day. 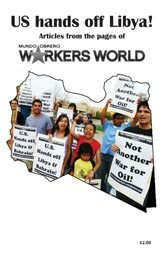 Two such support rallies were held in New York and Philadelphia. Sue Davis writes that a statement posted on istandwithpp.org summarized the nationwide solidarity exhibited on Sept. 29: “We’re going to demonstrate just how many people across the country are willing to stand up and fight for women’s health and rights.” According to a poll conducted Sept. 24-28 by USAToday/Suffolk University, responses were 2 to 1 — 65 percent to 29 percent — in favor of continuing federal funding for Planned Parenthood. Davis reported that a noon rally in New York attended by several hundred, mostly women, of all ages and nationalities was held in Foley Square opposite the federal building. In addition to several city politicians, young women talked about the quality of services they received from Planned Parenthood and why the fight for reproductive rights is linked to the Black Lives Matter movement. Spoken-word poet Staceyanne Chin, a performance artist from Jamaica and lesbian rights activist, roused the crowd when she detailed why women must have the right to choose to be mothers, based on her own experience. In Philadelphia, about 200 people, many in pink T-shirts, signed petitions, chanted and took over the street in front of the Planned Parenthood headquarters on Sept. 29 to protest congressional efforts to cut funding for Planned Parenthood’s cancer screenings, birth control and other health services, reports Joe Piette.